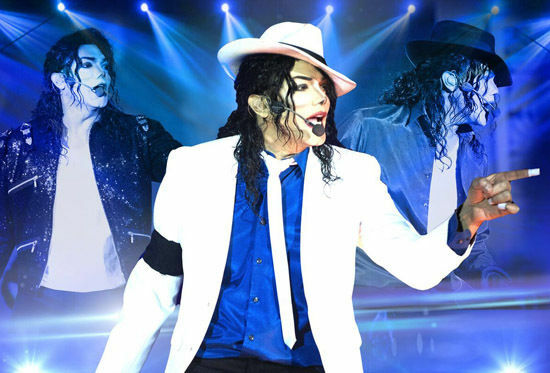 King Of Pop is led by the world’s number one Michael Jackson tribute artist Navi which alone sets this show above the rest. *Prices inclusive of booking fees: Phone/Counter - £2 per ticket plus postage charge where applicable. Online - £2 per ticket plus £1 per transaction for postage. Please note, concessions may not be available on every performance. Due to his incredible resemblance to the star, Navi was hired as Michael’s official body double/decoy. He also received a standing ovation from Michael Jackson himself after he was hired to perform his tribute at one of the stars lavish birthday parties. Navi was also recently chosen by Hollywood to portray Michael Jackson in a new, major movie about the star’s life titled 'Searching for Neverland'. Don’t miss this incredible production which features all of Jackson’s greatest hits such as Smooth Criminal, Beat It, Billie Jean, Black or White, Man In The Mirror and the ‘Jackson Five’ classics. All performed by Navi with the backing of his incredible live band, dancers and special effects in a show suitable for the whole family. Please note that all discounts are subject to availability. T&C’s apply. To book a lounge or box, wheelchair position, or for an access assisted performance (captioned, audio described, signed) where applicable, please contact the box office on 01274 432000. For groups of 20+ please contact 01274 437788. Maximum of 10 tickets for this event can be booked online.